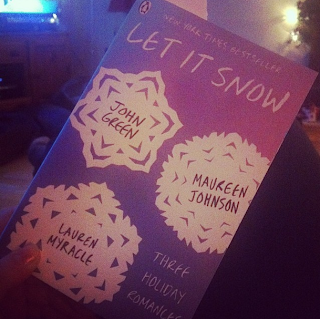 Beautiful You: Book Review #2 | Let It Snow - John Green, Maureen Johnson and Lauren Myracle! Book Review #2 | Let It Snow - John Green, Maureen Johnson and Lauren Myracle! I have done a book review on my blog before and I have just read a really fantastic Christmassy book and I thought that I would share my thoughts on it with you guys as well. I'm sorry if you don't like these types of posts but I really enjoyed the book and I think that a lot of people my age would to so I thought that I would spread the word! As you all know if you have read my previous book review, I am currently loving John Green. His work is fantastic and I wish he would write more books because there are only two left for me to read and I don't want it to be over just yet. They way he writes makes me not want to put the book down and from start to finish I am hooked; it is like I'm in a trace! The book that I have just read is called Let It Snow and it is a compilation of three books in one all written by different authors; however they are all interlinked with each other. When I started to read the book I didn't really think that I would like it that much because each story is shorter because obviously there are three in one book and I'm not a huge fan of short stories. However although they are shorter the content of each one is so gripping and keeps you reading you have to carry on to find out how they are linked because the first one is over so quickly. As I read this book close to Christmas I think that helped because I could just imagine how they are feeling and I could relate to it because they are around my age and it is sort of the same time period, this helped me to engage with the book more which in my opinion made it more enjoyable. The whole story line was so heart warming that I don't know how anyone could dislike it, I can't really speak highly enough of this book and I enjoyed it thoroughly! The book as a whole was genius and because not only does the reader get to have the works of three fantastic authors in one book but you get to read their different styles and see how they all still blend and work really well together. I loved how all the characters face trials and tribulations but then in the end, just because its Christmas, everyone got a happy ending and who doesn't love a book with a happy ending? Everyone, even those you may not admit it, loves a happy ending! And I love how everything fits into place at the end of this book, truly magical! I hope you enjoyed my second book review and that it was better than my first. Thank you for reading and I will be back with many new blog post soon, keep your eyes peeled! I hope you all had a good Christmas, spent a lot of time with you family and got some lovely gifts! it has a lovely plot and these three authors have done a fabulous work in bringing together the stories of three strangers. after turning the last page, you can't help but smile. a must read and perfect for the holiday season.